CAN YOU SAVE A BORER INFESTED TREE? HOW DID MY TREE GET INFESTED? Tree borer beetles include a wide range of insects which feed on trees. Some target specific trees but here in the United States, we have hundreds of species and many can thrive on a range of tree species. So if you discover a tree with some kind of boring pest, it could very well have different insects active. In general, all tree boring pests are members of the beetle family though their shape, size and color can vary. Some are quite small, like the turpentine beetle and others can be several inches long like the hissing borer. Root borers can be massive reaching lengths of 3 inches or more! 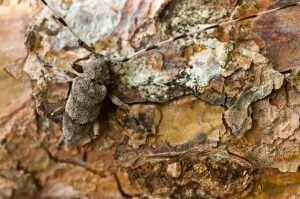 Boring beetles will fall into three types: those which thrive just under the bark, those which bore through the trunk and those which live in the root system of the tree. And though some species can infest a tree without being noticed, others will produce piles of sawdust as they chew. The bottom line is that once a tree gets a beetle problem, it will likely get worse and spread to other trees in the yard. We get asked this question all the time. In general, its not possible to know for sure but here is a simple guideline on what to expect assuming you follow the treatment outlined below. For trees with noticeable insect activity but no sign of poor health, treatments will knock out the active pests and ensure it stays healthy. For trees that have just turned brown, lost foliage and show insect activity, there is a very good chance you can save them. This is especially true if the tree has only started to look this sick recently, like in the last 6 months and if you take action now, before its too late. For trees that have not shown any new growth for over a year, its 50-50. Trees can go dormant for a year or two before completely dying and we’ve had many reports of customers treating a “dead” tree only to see it come back the next season. 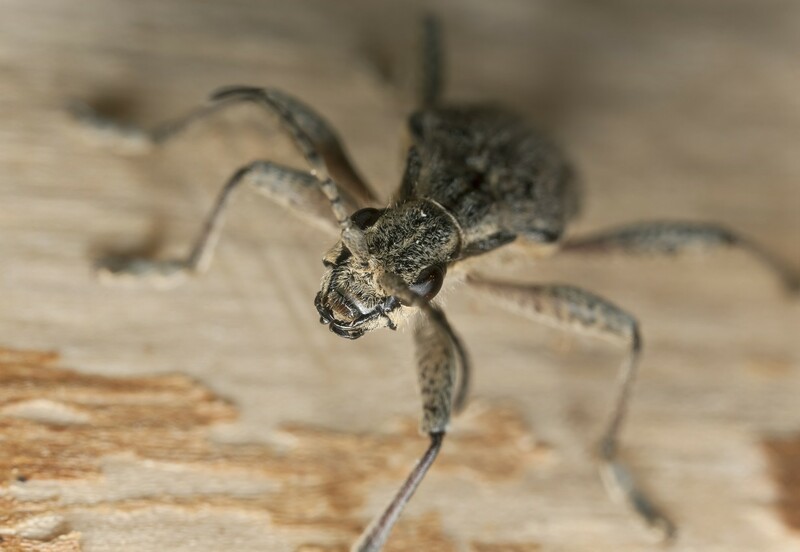 Tree borer beetles are naturally attracted to pine trees by smelling the trees sap or the pheromones released by other beetles currently feeding on the tree. Though most trees will emit small amounts of sap naturally, trees which sustain injury due to man or nature are more likely to get beetle activity quicker. Pruning at inappropriate times (like the spring or summer), mechanical damage to the bark, lightning, drought, disease or other insect damage like that which can occur from termites are all things that can make a tree more susceptible to tree borer beetles. 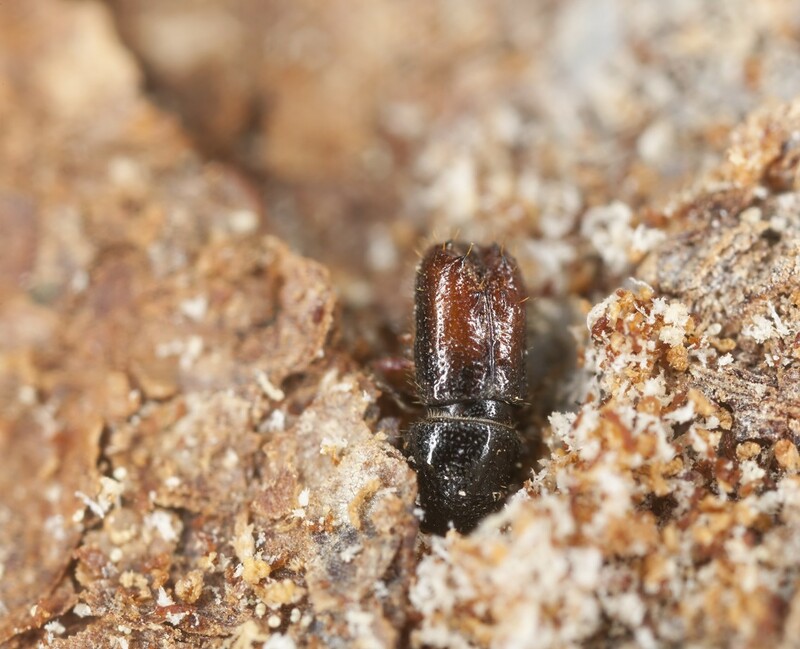 Once a flow of sap is more than normal, the odds increase in the beetles favor. But even a perfectly normal healthy tree will emit or release some sap that can attract beetles. Now when a tree is injured and sap runs freely, the odds that beetles find the tree are greatly increased. 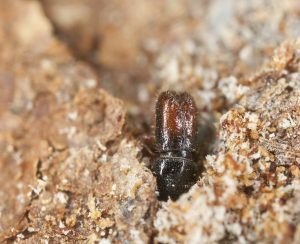 Once found, beetles will penetrate the bark and then begin excavating tunnels either under the bark or into the heart of the trunk. Often times their tunnels will serve as egg cavities but some species will lay eggs outside the tree bark or down in the roots. 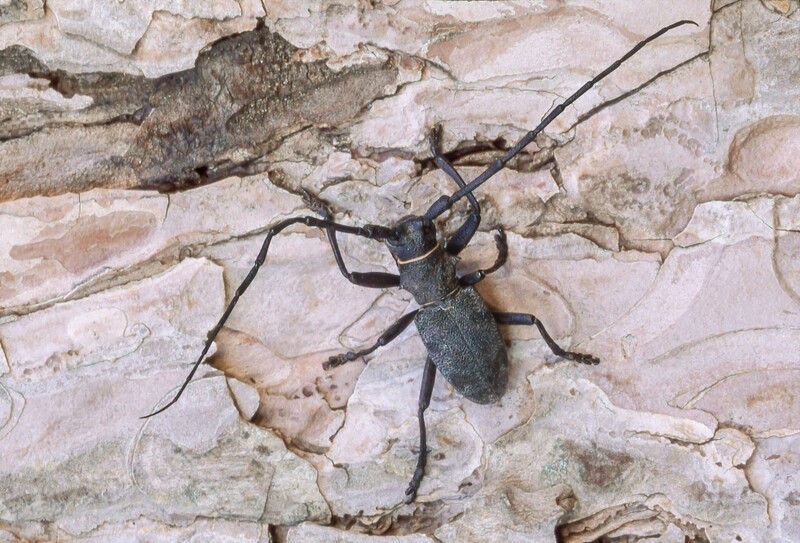 The control of tree borer beetles is really not a control as much as it is a preventive treatment. Trees which have activity are difficult to save. This is true for two reasons. First, once a tree is infested, the adults and larva are active behind the bark which serves as protection from conventional sprays. Secondly, rarely does anyone spot a tree with only a beetle or two. However, it can be done. If you happen upon a tree which has only minor and beginning beetle activity, it can be saved. For this reason you must consider all options and then make a decision based on what makes you comfortable and what gives you piece of mind. Here are some general guidelines for both the prevention and control of tree borer beetles before and after activity has been found. 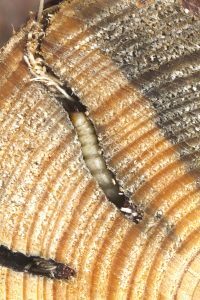 If you are in a region where tree borers are active and want to protect them from attack, spray the bark at least once a year with CYPERMETHRIN. For trees with activity, spray them at least once every 6 months for the first year. Cypermethrin is highly repellent to beetles and the treatment will be absorbed by the bark keeping boring pests away for many months. Even trace amounts will cause them to forage elsewhere so for long term, easy to apply protection for trees with little or no activity, spray the main trunks from the ground up 10-12 feet. Cypermethrin should be applied at a rate of 1 oz when treating to prevent; 2 oz per gallon when treating an active infestation. For trees with activity, plan on treating twice the first year and once a year after that to keep borers away. Remember to treat any and all trees you want to protect and not just the trees with sign of activity. These applications will help keep away carpenter ants, termites, carpenter bees and other wood destroying insects which can all weaken and contribute to any trees demise. 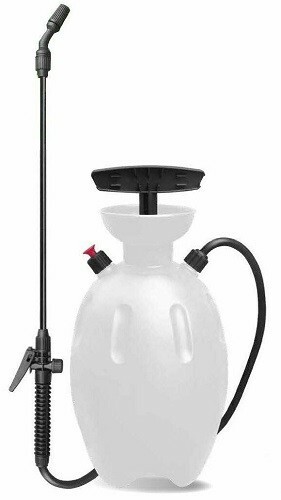 Most any small job (5 or less trees) can be handled using a standard PUMP SPRAYER. 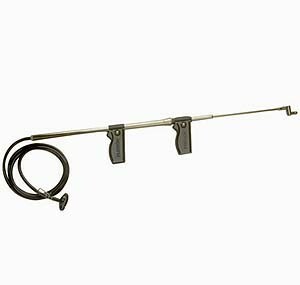 When treating 5 or more trees, a HOSE END SPRAYER will prove more efficient. 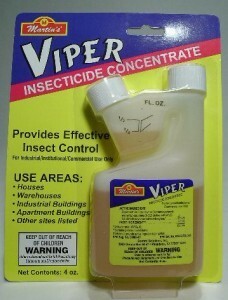 Using our sprayer, you’ll want to add 10 oz of Viper to the sprayer and then fill it half way. The entire tank can then be sprayed over 10-20 trees with an average trunk width of 12 inches. If you feel you need to reach heights of 15 feet or more, our TROMBONE SPRAYER can be useful. It can reach over 25 feet and is completely portable making it ideal for remote locations. For trees with visible holes, inject them directly with CY-KICK AEROSOL. This product comes with a straw (similar to WD-40) ideally suited for injecting any hole you can find. Pitch marks (places where sap is running out) should be cleaned out first to help allow the aerosol to penetrate as much as possible. Now if you poke and prod the bark gently, many times you are able to find loose sections of bark. Such areas could have activity or might be targeted as a good place to lay eggs. In some cases drilling small holes into the bark just deep enough to enable spray to trickle down behind the bark can help too. This type of treatment can be tedious but it can help by killing off feeding larva. When treating, try to inject each hole for 10-15 seconds if its receptive. The pressure of the can along with the aerosol sized particles which are released insures a thorough treatment will disperse behind the bark and hopefully reach feeding larvae as well as active adults. Focus your treatments around the trunk spacing holes 1-2 feet apart depending on how well each treatment hole takes product. The more each hole will take the less holes needed. Holes don’t need to be bigger than 1/8 of an inch so the exit holes from beetles which have already left can be utilized and many times will be all you need to treat. For trees showing significant activity and signs they may not make it, supplement your program with ADONIS SYSTEMIC. This treatment is done by pouring mixed solution down into holes you make around the tree. Once applied, the treatment will be absorbed by the trees root system and as it gets dispersed up and into the tree, it will kill any insect feeding on the protected foliage. 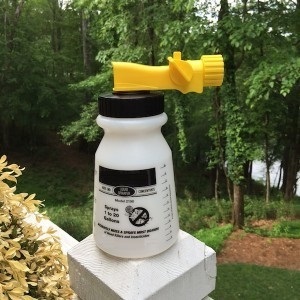 Though this won’t control borers living behind the bark, it will kill drilling borers and other pests like moths, aphids, thrips, cicadas, whiteflies and more. Remember, any insect feeding on the affected tree will be weakening it so the extra protection using a systemic will provide can often times help indirectly. To prepare the ground for the treatment, you’ll need to create small holes inside the trees drip line (this is the area underneath the canopy of the branches), about 2-4 feet around the base of the trunk. 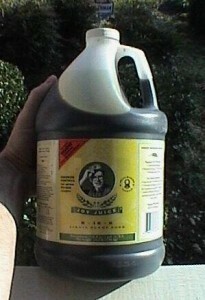 Make 5-8 holes for every 3-4 gallons of mixed solution you apply. To make the holes, use a pick axe or piece of rebar. Remember, these holes only need to absorb the mixture you’ll be applying so it soaks down to the roots. In other words, the holes don’t have to be deep. The amount of Adonis needed will depend on the width of the tree. Use .1 oz per inch of width. This means for a tree 10″ wide, you’ll need 1 oz of Adonis mixed in 3-4 gallons of water. A 5 gallon pail is well suited for the task; add 3-4 gallons of water to the pail and then 1 oz of Adonis and you’re ready to treat a tree 10 inches wide at the base. Treat annually (once a year) any tree with activity and any other tree you want to be protected as well. Adonis can be used on shrubs, trees and other plants too. 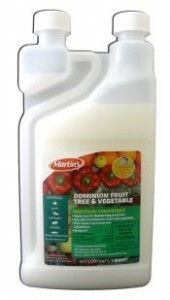 If you need to treat a peach, apple or some other fruit bearing tree, go with FRUIT AND VEGETABLE SAFE SYSTEMIC. It uses the same active as Adonis but its not as concentrated so its safe for use on trees yielding harvest intended for consumption. Use 1 oz per 6″ of tree width in 2-3 gallons of water. Treat twice a year; once in early spring and once in early fall. For active pests on tree foliage or in the bark, add 1 oz per gallon of water and spray to the point of runoff. 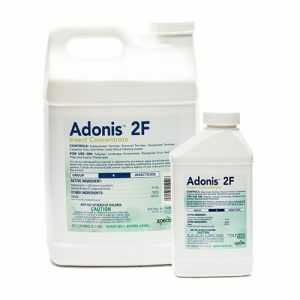 Like Adonis, the active will take 1-2 days to kill target pests so do not expect to see insects dying the first day after you spray. When soil drenching infected trees with Adonis, its a good idea to add some JOY JUICE liquid fertilizer to the pail. Use 1 oz per gallon of mixed Adonis. The two can be added to the same bucket and applied simoultaneously so it won’t take any more work to add some food to you tree. We often get asked if suffering trees can be saved and the general rule is this. If the tree has been “brown” for 2 or more years, its probably dead for good. But trees that turned 1.5 years or less can be usually be saved if given the right treatment and some food. Joy Juice is easy to apply, quick to absorb and you’ll know within 30 days if your effort is working. Thank you for posting this information. I have a tree that has borers and has been treated but sustained quite a bit of damage. This article has helped me decide what to do. Thank you!!!! Hello, I have 3 paper birches infested with (probably) bronze birch borers. Their drilled holes that exactly fit the descriptions. I have got very few bees in my area and am sick about the bee die offs. Please tell me if any of your treatments will NOT kill bees. I live in southern Washington state on the Columbia River. They have not come out yet but I would prefer a natural solution to this problem. Thank you. The two products we have listed in our tree borer article can kill most any insect including bees. But if you apply them to the bark of the birches (and the holes you see), there is pretty much no risk or danger to non target insects like bees. I say this because the actives in these treatments will only work if insects are crawling over the chemical. And since the Cypermethrin is highly repellent to insects, it will essentially keep bees, borers and other insects off the treated surface. In fact this is why it should be used to “prevent” infestations; its high repellency will keep target (and non target insects like bees) off the birch and in doing so, keep it safe from unwanted insect damage. As for the Cykick; it will only work if insects are coming in contact with the chemical. So if you limit your treatments to the holes you see, there will be no danger presented to local bees. On a side note, the main issue with bees sustaining injury from pesticide treatments is more centered on the treatment of flowering plants which bees frequent for food. Efforts to protect these plants has taken its toll on all pollinators and this is a problem that must be confronted or else we stand to loose a valuable resource. But the treatment of your birches will be far removed from the “sensitive” bee zone so you can proceed without worry or concern over any kind of impact to the local bee population.